A guilty pleasure. Rent when you're in the mood for amusing, enjoyable crap. Let's dispel any notion that "Timeline" is a good movie right here in the first paragraph of this review: It's a ridiculous, paradox-packed, sci-fi/action contrivance about archeology grad students zapping themselves to the 14th century to rescue their trapped time-traveling professor. By all rights it should be a cheesy cable-TV movie, but for the extra zero added to the budget and the fact that the hero is newly bankable, plastic-actor pin-up boy Paul ("yo, bro!") Walker, star of "The Fast and the Furious" movies. But I'd be lying if I said I didn't get some guilty pleasure out of this inflated adventure, which drops its cast into the middle of an over-produced swords-and-armor castle storming. Because the actual plot is laughable from scene one, which juxtaposes an SUV driving through the desert in 2003 and a peasant being chased by a mounted knight in 1357, I'm not going to bother explaining how or why the professor (Billy Connolly) and his apprentices wind up in the middle of a 650-year-old battle, helping French soldiers repel the occupying English who, history has it, hanged a pretty young noblewoman named Lady Claire (Anna Friel) from a castle turret as a badly miscalculated deterrent. What's important is that once they're in Old World France, the captures and escapes (they're also chased by mounted knights), the trumped-up love stories (one archeologist falls for Lady Claire, of course), the flaming-balling catapults and broadsword/bow-and-arrow combat, and the characters' foreknowledge of events make for some good popcorn chomping. Director Richard Donner -- who through four "Lethal Weapon" movies, "Scrooged," "Maverick" and "Conspiracy Theory" has never taken himself too seriously -- blissfully ignores any notions of the time travelers polluting history and any concept of language barriers (all the important French characters know a conveniently modern English dialect). 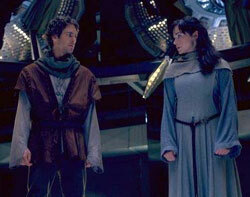 The film's 1300s are too Renaissance-Faire premeditated in production design and costuming, and the 2003 part of the story, in which scientists battle against time to repair their grenade-damaged teleport machine (don't ask), is predictable plot-padding (no surprise from a book by high-gloss, high-concept techno-schlockster Michael Crichton). Yet "Timeline" offers up some charismatically flashy performances too -- particularly from supporting players Michael Sheen as a patronizing French lord and Gerard Butler as a rough-and-tumble modern interloper -- and some bracing battle scenes that go a long way toward raising it to the higher echelons of B-moviedom. Pity that Walker's synthetic performance and the over-saturated, incessant score drag it back down again. But then, even Walker has his moments as the frivolous son of the professor who has no real interest in history. When he's not busy looking like a surfer dude way out of his element even before he goes back in time ("I don't understand you guys. You all live in the past," he obtusely opines), the ordinarily artificial actor has a pair of surprisingly natural, unaffected character-establishing conversations -- one with Connolly (real father-son chemistry here) and one with Frances O'Connor ("A.I.," "Mansfield Park"), the scholarly object of his desire and the only reason he hangs around the dig site. So why does "Timeline" earn entertaining brain-check status in spite of its often preposterous plot holes, synthetic star power and narrative machinations? Sometimes even a movie critic can't fully explain these things. What can I say? It's a dumb movie, but I had fun.